The Collinsville City Commission met Monday, August 2nd at 7pm (at the City Hall Annex, 1126 West Main) for the regular meeting of the Municipal Authority and Commission. All Present: Mayor Stan Sallee / Vice Mayor Gail Rogers / Commissioner Pam Porter / Commissioner Melodie Bateman / Commissioner Brad Overholt. 1. Report from City Auditor, Jim Rush on Financial Statements, Supplemental Report, and Planning Report for Year End June 30, 2004. The auditor said everything appreared in order. Mr. Rush did point out a few items that he felt the Commissioners might want to note. He said sales tax income was flat compared to last year; trash collection brought in $41K more than last year; misc. income (e.g. surplus auctions) were up $113K; EMS required half as much subsidy as last year (only $40K); Police Department expenditures were up (with the new building set up this year). 2. Consideration and possible action to award Solid Waste contract. After a lengthy discussion over which portions of the original bid could be considered -vs- new bid information/clarifications, a motion was made by Commissioner Pam Porter to renew the Risley's & Son Inc. one year contract (with existing containers). That motion died for lack of a second. Commissioner Brad Overholt then moved that the bid of Waste Connections Inc be accepted for the 3-year option with polycarts and once a week pickup. That motion was seconded and approved (with Porter voting against). At that point the Risley's indicated they would no longer be picking up trash (beyond August 20th) as they were already beyond their last approved contract and the only workers that hadn't quit when the original contract was not approved would be back in school by that time. At the previous commission meeting there was discussion to allow Risley to have the business for at least 60 days assuming that if a different contractor was selected they would need at least 30 days to get new trucks and polycarts. Waste Connections representative at the meeting (Brenda Merchant) offered to try and start before 30 days if the city needed that to happen. She said that early start would have to be without new containers initially. Before a multi-year contract can be finalized the solid waste collection funding will need to be moved from the city to the CMA ... which the auditor agreed is where it probably should have been already. 3. 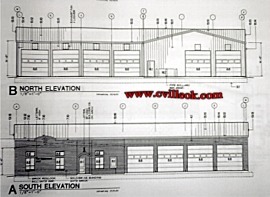 Consideration and possible action to award EMS/Fire Station construction contract. 4. Discussion and possible action on Resolution 2004-07 regarding to a flashing speed sign in the area of Highway 20 & Collinsville High School. (see photo above ... link to previous discussion). The commission approved spending $4000 to help ODOT put a flashing warning sign near the high school. The school was unable to pay for it directly as the sign would not be on school property. The school did however offer some options for the city to recoup the cost. Those options including reconsider of the previously requested waiving of demolition fees for middle school buildings and use fees for city park tennis court use by the schools. 6. Consideration and possible action to approve contract language for the lease purchase of two police units previously approved by the City Commission on May 14th, 2004. (Approved ... this was contract wording change to conform to state law for city budgets on a fiscal year basis instead of multi-year normal lease). 2. City Manager Report: Collinsville Mayor Stan Sallee is now a member of the Tulsa County Criminal Justice Authority along with other local mayors. Mike Tinker is the new vice chairman of an INCOG transportation group. The City will provide ~$4000 for a flashing speed sign in the area of Highway 20 & Collinsville High School.